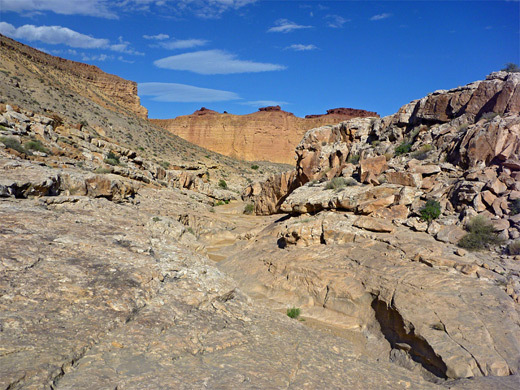 Cutting through the west edge of the San Rafael Swell, the long drainage of Muddy Creek has many narrow tributaries, the majority on the remote west side, reachable only by 4WD tracks and/or cross country hiking. Land to the east is more accessible, via the good roads to Tomsich Butte and Hidden Splendor, and while there are fewer ravines here, at least one forms a good slot - this is Music Canyon, unmarked on topo maps but named (recently) for the favorable acoustics of an enclosed chamber near the lower end, shortly before the junction with Muddy Creek. Only a hundred feet or so of the canyon is easily explorable from the creek, before a dryfall blocks the way, but all the slot may be seen if starting from the top, after a 3.5 mile walk down the open, upper part of the drainage. 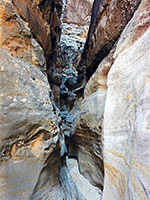 Even here, ropes are needed in three places, to pass falls of up to 20 feet; the ravine above the first such obstacle is not so enclosed, though still quite scenic. The canyon is certainly remote, 25 miles from the nearest paved road, but receives more visitors than might be expected since canyoneering training courses are sometimes held here, the few rappels being relatively simple. 13 views of Music Canyon. Topographic map of Music Canyon. Music Canyon may be reached beginning either at I-70 exit 129, or Temple Mountain Road near Goblin Valley. From the interstate, a well maintained gravel track crosses generally flat, grassy terrain for 14 miles to a junction with the other route, which is rather narrow and bumpy for a while as it winds through the upturned, reddish-brown strata of the Moenkopi Formation, but improves further west, once past Flat Top butte. Continuing south, the track is smooth and level as it traverses the central grasslands of McKay Flat, and reaches another intersection after 9 miles; straight on leads to Tomsich Butte while the left fork is to Hidden Splendor Mine. The start point for the Music Canyon hike is 4 miles south along the mine road, which is a little narrower than before but still a good route suitable for all vehicles, running at the foot of a long line of grey sandstone cliffs (Big Ridge) then descending slightly and crossing the very upper end of the target drainage. Parking is limited hereabouts owing to high verges, but some parts of the track are wide enough for vehicles to be left at the side of the roadway. Other landmarks in the vicinity are an abandoned car a short distance south, and a line of straight cliffs to the north, made of dark, weathered, fractured sandstone - a feature that continues northwestwards for 2 miles, bordering the north side of the drainage, and also extends a long way south. 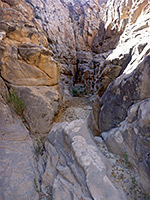 A short walk downhill from the road leads to the streambed of Music Canyon, which is then followed for 3.5 miles to the start of the narrows. The drainage drops down steeply in the upper end, descending via dryfalls and boulder piles, but soon becomes much flatter, and most of the hike is along the nearly level floor of coarse sand or slickrock. The surrounding rocks (Moenkopi Formation) have the usual mix of different colors, textures and eroded shapes, but overall the scenery is little changing for 2 miles, until the stream bends to the left (southwest) and becomes very wide for a while. Eventually the cliffs at either side start to come closer, and the drainage gradually slots up, forming lengthy enclosed passages, moderately narrow - this after a descent of nearly 1,000 feet from the trailhead. 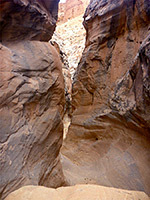 The first major obstacle is a chokestone that creates an overhanging drop of ten feet, just after a level section where sand has built up allowing a few bushes to grow in the otherwise vegetation-free passageways; this also the first point where climbing back up is difficult without ropes. Shortly after is a larger drop, followed by two more, before the canyon, now dark and enclosed, joins Muddy Creek in the middle of its narrowest section (the Chute). 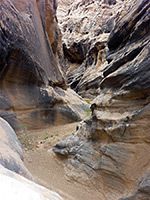 In general, the rocks in the narrows of Music Canyon are greyish-brown in color and not especially pretty, irregular and angular rather than smooth and polished.